A few days ago, I logged into an old email account to clear out my inbox. I had been avoiding it for months. The emails in my inbox weren’t personal and dealing with them felt more like a chore than an exciting way to spend my Sunday afternoon. I know I’m not the only one who feels this way because reports show that many consumers also can’t remember the last time they received a memorable promotional email from their favorite brand. As an email marketer, I know we can do better than this. I know we can exceed subscribers’ expectations if we focus on making our emails a bit more personal. If you look at the numbers, personalization can increase the click rates of your email marketing campaigns by 241% and it can be really easy to set up. If you haven’t collected any personal information on your subscribers, don’t worry! You can still personalize your emails even if you don’t know the locations, names, or companies of the people on your email list. To see how this works, check out 3 creative tactics you can use to personalize your email marketing campaigns. 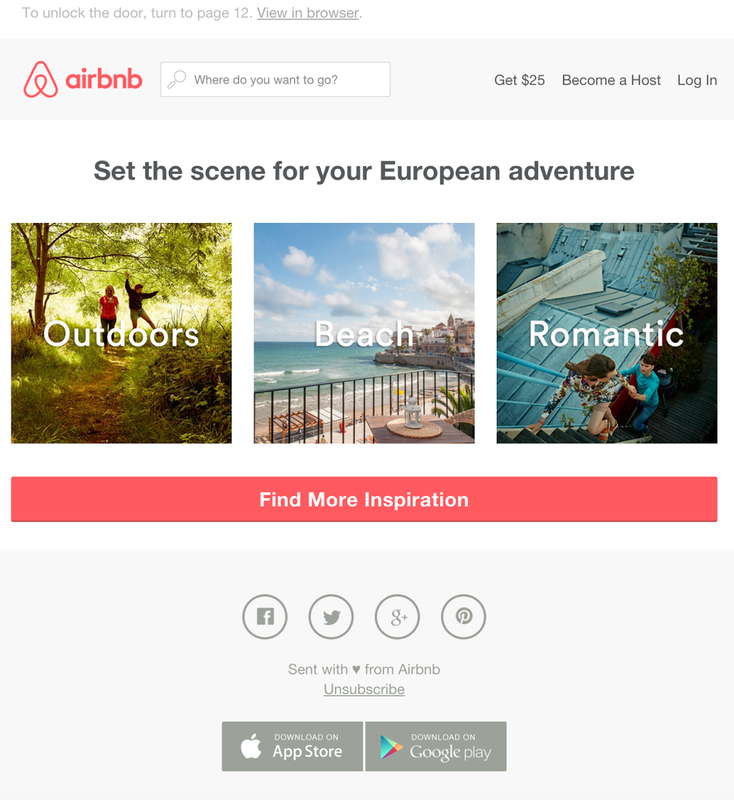 Airbnb’s first email in the series started with the subject line: Choose your adventure. Inside you would find three destinations: Europe, Asia, and North America. Based on the destination you selected, you would receive a follow-up email with information on this place and the subject line would read something like: Your adventure in Asia awaits! Afterwards, Airbnb would hone in on your interests and ask you to select your ideal getaway. For example, if you choose “Beach” and you would receive a follow-up email with a subject line that reads: Ready to embark on your beach adventure in Asia? The behavioral series would end with Airbnb showing you their top beachside destinations in Asia. 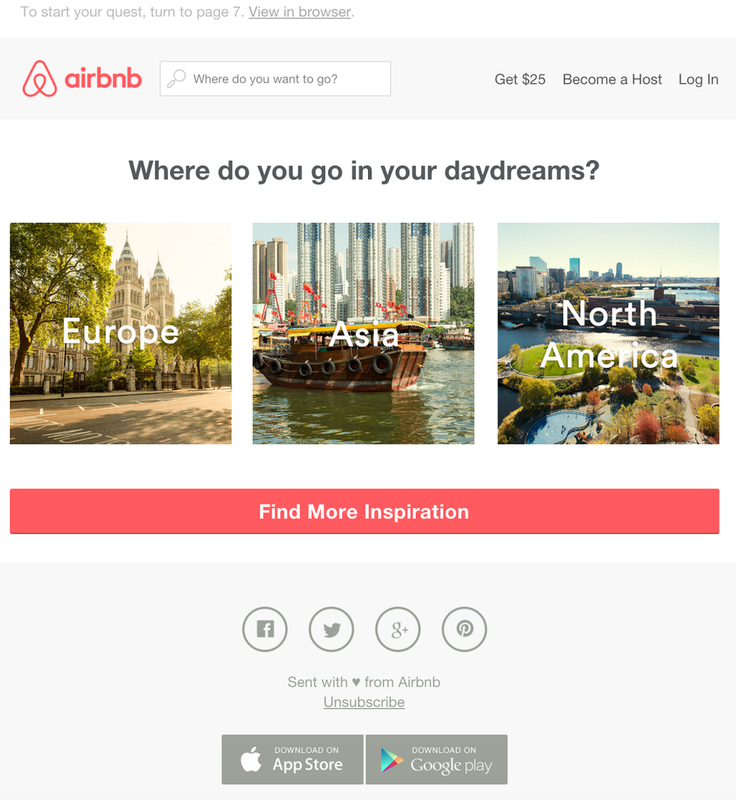 This personalization tactic helped Airbnb bring more relevant content into their emails and set expectations for how subscribers should interact with the company’s platform. Another way to utilize behavioral email series is with a welcome email. Not only is a welcome email the perfect first impression, but it also helps you further personalize your subscribers’ email experience. If you have customer personas built, you can simply ask your customers to choose between two different persona options in your welcome email. This choice then sends your subscribers into an email drip that fits that specific persona. Here’s an example of how Paper Style, a wedding invitation website, did this with their welcome series. The company focused on two personas: individuals planning a wedding and friends or relatives attending a wedding. Paper Style wanted to personalize the experience for these two different groups because its previous “batch and blast” approach had reduced response rates. With this behavior-based email, new subscribers were assigned to one of these two groups and sent personalized emails. The results were incredible! Paper Style’s open rate increased by 244% and their click-through-rate went up to 161%. Airbnb and Paper Style both focused on giving subscribers a choice, and encouraged their subscribers to see email communication as an interactive dialogue. This type of personalization works and is a great option for email marketers who don’t have detailed customer data. A couple months ago, I subscribed to the email list of a growth marketer named Josh Fechter. When I signed up for his newsletter, I only gave him my email address, so I knew he didn’t have any firsthand data on me. Despite lacking this important information, Josh still managed to make every email personal. How? By treating his subscribers like friends and sharing things they would be excited to read! Here’s one example of an email he sent back in May. What do you notice about it? For starters, he provides a link where his community can receive his growth hacks if they connect with him via Facebook Messenger. Notice that this tactic also allows Josh to see his subscribers’ Facebook profiles so he can learn more about them. Afterwards, he announces he’s looking to help entrepreneurs with their community building and tells people to reply back to his email. Lastly, he includes a simple growth hack in the newsletter–which is something that his subscribers joined his list to learn more about. This email is filled with freebies and Josh’s welcoming tone makes you feel like you’re having a direct conversation with him. By engaging with his subscribers in this way, Josh learns about them without directly asking for their name, location, or where they work. Personalization doesn’t have to be limited to just the data you collect when someone subscribes to your list. You can also collect information about your email list by finding the social media profiles of your subscribers. Collecting the social media data from your email list gives you demographic information, like where they’re from or what they do for work. Once all your accounts are connected in Zapier and your Zap is turned on, you’ll be able to see your contacts uploaded in FullContact. Continue to your FullContact dashboard and you’ll find the job, location, and social media information of your uploaded list. From there, you can start segmenting your email list based on the data that was collected. If you want to make your emails memorable, start by making them personal. Lacking subscriber data can seem like a barrier to creating personal emails, but it actually spurs creativity to improve your email marketing strategies. In these examples, you saw that personalization isn’t just about including someone’s name in the subject line–it’s about recognizing that there’s someone on the other end of your email communications. It’s easy to replicate these types of personalization tactics if you remember that personalization is simply about adding a human touch to the emails you send. What tactics have you used to personalize emails without subscriber data? Share your experiences in the comments. I’d love to hear your stories! Sign up with your email address to receive new marketing tactics.